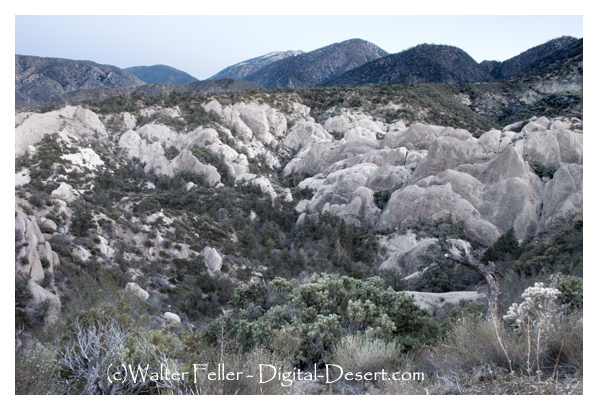 Devil's Punchbowl, elevation 4,750', is one of the most fantastic, colorful jumble of rocks in Los Angeles County. It is a county park within the Angeles National Forest on the northern slopes of the San Gabriel Mountains. There are short trails within the park which showcase the riot of geologic features along the Punchbowl and San Andreas Faults and there are connections to the major longer trails going up to the high country. The Devil's Punchbowl drainage flows into Sandrock Creek and another tributary of Big Rock Creek which disappears into the Mojave Desert. The rock so spectacularly exposed at the Devil's Punchbowl is the Punchbowl Formation made of ~5,000' of nonmarine light gray sandstone, conglomerate and thin shale strata. The rock was derived from weathering of granite from the Mojave Block, deposited in a formerly flat basin to the south of the Mojave Block, which was subsequently tilted by movement along the Punchbowl and San Andreas Faults. The Devil's Punchbowl rock is very similar to the Miocene (7-25 million years old from the Period from Dibblee; a more precise 6-15 million years old from Sharp) "Mormon Rocks" formation in Cajon Pass, but fossils show that the rock at the Devil's Punchbowl is younger, with ages of lower Pliocene to upper Miocene (~5-10 million years). Much speculation has been made about whether these formations were once in juxtaposition, and have been separated by movement along the San Andreas and Punchbowl Faults, but the faults are apparently complex enough that it is difficult to agree on a reconstruction. Both units may once have been next to matching rock to the south of Punchbowl fault that is now 30 miles to the northwest. Sources: Dibblee, in Geology and Mineral Wealth of the California Transverse Ranges, 1982; and Sharp, Geology Underfoot in Southern California, 1993. By Car: From SR-138 at Pearblossom, go south on Longview Road, N-6, to the Devil's Punchbowl Road. The $3.00 parking fee was cancelled August 1, 1999. By Trail: The Burkhart Trail comes in from Burkhart Saddle to the southwest. The Punchbowl Trail comes in from South Fork Campground to the east. 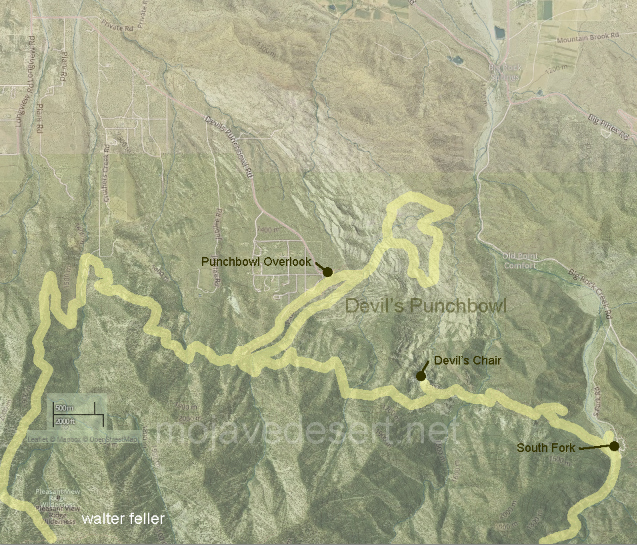 These trails are parts of the High Desert National Recreation Trail system. 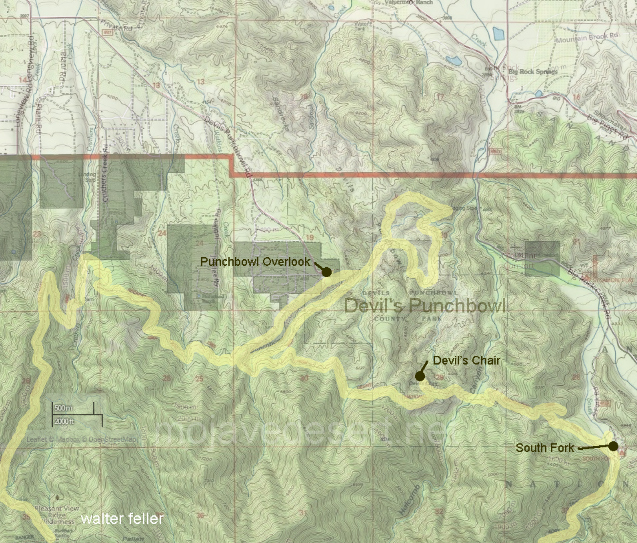 Inside the park itself are other shorter trails like the Devil's Punchbowl Loop Trail.